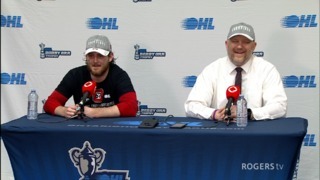 The 16th edition of the Wawanesa OHL Plays of the Week for the 2018-19 season feature a collection of the league’s Top-5 goals during the week ending January 13. 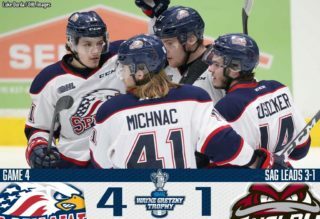 This week’s highlights start with some superb chemistry from the Saginaw Spirit with a tic-tac-toe goal with Blade Jenkins and Brady Gilmour connecting to feed newcomer Owen Tippett. We continue with a sensational first career goal scored by North Bay Battalion rookie Kyle Jackson, and a breakaway goal by Riley Damiani in overtime for the Kitchener Rangers sprung in alone by a stretch pass from Joseph Garreffa. 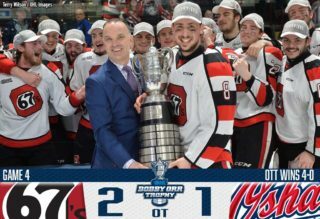 The reunion of former minor hockey teammates Nick Suzuki and Isaac Ratcliffe looks good early on for the Guelph Storm, and Evan Bouchard of the London Knights tops the countdown with a behind-the-back pass for Josh Nelson on the national stage.